It wasn’t a State Visit. No red carpets and Royal Family at Victoria Station. No carriage procession along the Mall. But it was the very next best thing. 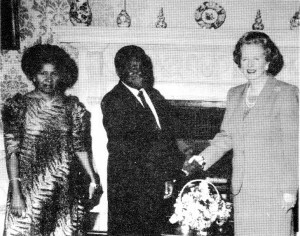 An official visit (from June 6th to 10th, 1988) at the invitation of the British Government. And, from all accounts, President Mwinyi received a ‘right royal’ welcome. The visit was on similar lines to the farewell visit which Mwalimu Julius Nyerere made in March 1985. Tanzania’s President Ali Hassan Mwinyi remains largely unknown outside his own country. Unlike his charismatic predecessor, Mwalimu Julius Nyerere, Mwinyi has done little travelling abroad; and even when he attended his first Commonwealth Conference last year he remained silent throughout the meeting. ‘I am a new boy and I would like to learn and listen’ he told me when I remarked on his silence. Mwinyi has been characterised as playing two opposite roles; some say he is merely a placeman for Nyerere; others claim that he is determined to unscramble the socialist institutions created by Nyerere. Placeman or Antagonist? The answer is that Mwinyi is neither of these. He is devoted to Nyerere and an ardent believer in the kind of egalitarian socialism which his predecessor has sought to make the national ethic of Tanzania; but he is also independent-minded and, after consultation with his colleagues, he makes his own decisions. Because he is so short, (just over five feet), modest, and rather reticent in conversation with those he doesn’t know well, it is easy to overlook the true stature of Nyerere’s successor. Mwinyi has described himself as ‘a government official duty-bound to the public’. Although not a vanguard leader, this self-denigration as a super-civil servant does not do justice to his achievements in the first 30 months of his presidency. He acted decisively in the way he completed the long drawn-out negotiations with the IMF in 1986 and has toughly defended his agreement against critics in the ruling party. He has brought a new smack of authority to the running of the bureacracy and in fighting the incipient corruption that has been building up in the country. Discipline in the civil service became much tougher; obstructive senior officials were firmly dealt with; and the entire administration was made more efficient. Like Nyerere he has been frank in admitting failures in the system and in publicly criticising the weaknesses that have become so manifest. Mwinyi’s main political problem at present derives from the continuing troubles in Zanzibar from where he originates. Dissidents on the Isles – some of whom are determined to secure their secession from the mainland and to break up the Union – have proven hard to control despite the recent tough action in expelling seven senior government officials from the ruling party. Britain’s High Commissioner in Tanzania, who accompanied the President throughout his visit, has kindly described, succinctly, for the Bulletin, all that happened during the official part of the visit. President Mwinyi was given lunch by the Her Majesty the Queen at Buckingham Palace and inspected a Guard of honour of the welsh Guards before calling on the Prime Minister, and dining at 10 Downing Street. 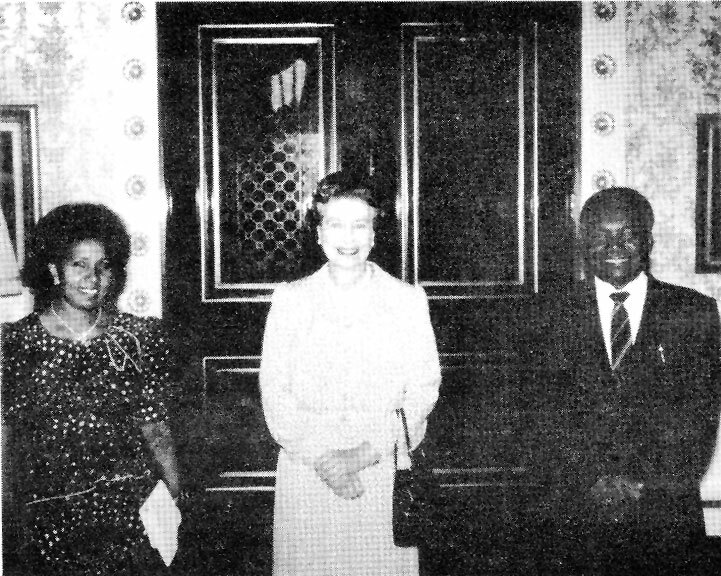 He was entertained at a Government dinner at Lancaster House, at the Mansion House by the Lord Mayor and at the Royal Commonwealth Society at a joint meeting of the RCS, Britain-Tanzania Society and the Royal African Society. He also met members of the East African Association, and visited Brooke Bond, Booker Agriculture International, British Aerospace and the Overseas Natural Resources Development Institute (ONDRI). 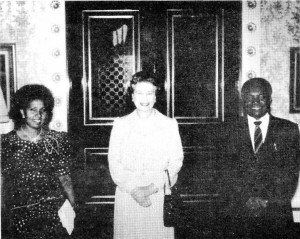 The Chairman of the Britain-Tanzania Society and senior officers called on him at his hotel. The formal part of the visit finished with a very happy reception at the Residence of the High Commissioner for Tanzania in Highgate. Mama Sitti carried out a separate programme which included the hospital for Sick Children in Great Ormond St., where a number of Tanzanian children have been treated, and where she made a donation to the wishing well appeal. In his speeches to the East African Association, the Royal Commonwealth Society and at the Lord Mayor’s luncheon, President Mwinyj gave a frank account of the economic problems facing Tanzania, thanked donors for their help and warmly invited new investment particularly in sectors that would earn foreign exchange such as agricultural exports, natural resources and tourism. He said that there was ample room for both public and private enterprise; and particularly for joint ventures between the two. He explained that because of the present shortage of foreign exchange it was not possible at the moment to externalise some of the earnings; but the Government would honour their obligation to do so as resources allowed. and pledged a further £10 million aid, to add to the £70 million Britain had already pledged over the past two years in support of the Economic Reform Programme. The highlight of the visits outside London was a lively presentation at ONDRI on the larger grain borer (a major pest in Tanzania) and on other subjects relevant to Tanzanian agriculture. These included a practical cooking demonstration of recipes for sorghum. Booker Agriculture’s Brown Candover farm impressed the_ party; and they were Interested to see Tanzanian tea at Brooke Bond’s factory. President Mwinyi stayed on in London for two weeks after the end of his official visit for medical consultations’. During this extended period Tanzanians from all over Britain were able to meet their President at a packed meeting organised by the Tanzania Association at the Royal Commonwealth Society (on June 12, 1988). The language was Kiswahili and President Mwinyi was on top form. The meeting consisted of questions and answers and was scheduled to last two hours but went on much longer. The President began by saying that he was sure that what people wanted to know was how things were back home in Tanzania. His answer was short and to the point. There had been good rains in the North and the South (not so good on the coast) “but there is enough to eat” Loud applause. He then spoke for 25 minutes about the situation in Zanzibar. He explained the historical background to the recent tragic killings (see below) and how, for many years, Zanzibar had had a tough post- revolutionary government which had had to restrict citizen’s freedom. Now, suddenly, Zanzibar was free. It had got too much freedom too soon. And some people were abusing that freedom. Questions ranged far and wide – tax, devaluation, commerce, tourism, housing, the idea of a freeport, cattle being allowed to wander uncontrolled in the streets, nationalisation, education…. The atmosphere was very good humoured. The President gave long and detailed replies to all questions and would not allow the Chairman of the meeting to rule out any question asked. He seemed to speak with complete assurance, only rarely calling on his colleagues on points of detail, and his answers were always totally pragmatic. Some of his oratorical gestures were almost reminiscent of Mwalimu himself. But there was also drama. One Zanzibari said that he did not agree that the islanders were gorged with freedom. “They are free only as far as the ruling party lets them be” he insisted. For example, should the islanders wish to form a second party would the President let them? The revolution of 1964 and the bullying by the first post-revolutionary government had opened many bad wounds the President replied. More time was needed for them to heal. When the time was right, the ruling party and the government would not stand in the way of another party on the islands. But the questioner was not at all satisfied. He was eventually only prepared to resume his seat under pressure from the audience and on the understanding that he could see the President afterwards. The first experimental tea was planted in 1904 by German settlers at the Agricultural Research Station at Amani, near Tanga and at the Kyimbila Mission near Tukuyu. The first estate was developed by a Mr. C. Gee in the Usambaras in 1926. A land development survey in 1929 recommended that tea should replace coffee in the Southern Highlands and a Tea Officer was appointed. Free seed was distributed to interested settlers between 1930 and 1934 and a small tea factory was opened in Mufindi in 1930. By 1934 1,000 hectares had been planted which produced 20 tonnes of processed tea. 9.3 tonnes were exported earning a revenue of £1,150. The tea industry had begun. By 1938 tea production had reached 200 tonnes. During the Second World War many of the German tea planters had been interned and their estates taken over by the British Custodian of Enemy Property. The Custodian subsequently leased them to the Tanganyika Tea Company, a subsidiary of Brooke Bond Ltd. By 1956 production had increased to about 1,700 tons in Mufindi, 450 tonnes in Tukuyu and 740 tonnes in the Usambaras. Until independence in 1961 tea production was wholly in the hands of foreign companies, or private estates. Then began a rapid development of production by smallholders. By 1934 there were an estimated 28,700 farmers producing 4,000 tonnes of processed tea from about 9,000 ha. Most smallholder grown tea is individually managed and is planted either in isolated patches or within a larger block comprising all the tea from one village. The average holding is about 0.3 hectares, the largest being about 5 hectares. Much of the tea is clonal. Fertiliser and herbicides are supplied by Kereku, the Cooperative Union and these inputs are paid for by a flat rate levy on all green leaf sold to the Tanzania Tea Authority (which was established in 1968 and manages the planting and processing). The current annual average yield achieved by smallholders is 400 to 500kg ha of processed tea, These yields could higher be if some of the social and infrastructural constraints to production were removed. These include late delivery and application of fertiliser, unreliable transport and delayed payment for green leaf. Today, Tanzania produces 15-18,000 tonnes of processed tea annually from a planted area of around 19,000 ha. Only Kenya and Malawi in Africa produce more. About 75% of the production is exported and tea has become the third largest foreign exchange generator in the Tanzanian agricultural sector. The three main foreign companies producing tea in Tanzania are Brooke Bond Tanzania Ltd, George Williamson Tanzania Ltd., and the Mufindi Tea Company Ltd. which together manage some 4,500 ha in the Southern Highlands. They produce about 10,000 tonnes of tea each year. Other estates are privately owned, while some of those taken over by the Government in the 1970’s are now reverting to private ownership. Others are being run as joint venture companies between Government and an outside management/investment agency such as the Commonwealth Development Corporation. A large proportion of estate tea was originally propagated from seed and is therefore genetically diverse. Since about 1970 however most new plantings and all in-fillings have been with clonal plants either selected locally or imported from Kenya or Malawi. The productivity of certain tea estates has risen considerably over the last thirty years. For example, from 1955 to 1970 average yields increased at the Kilima estate in Mufindi from 600 to just under 1,000 kg of made tea per ha. This was partly due to increased fertiliser applications, a change in the type of fertiliser used, and replacement of hand weeding by herbicides. During the late 1960’s and early 1970’s shade trees were removed and in 1971 irrigation was introduced on a commercial scale. By the 1980’s yields (averaged over a four year pruning cycle) had reached 2,000 kg, per ha. Since 1980 yield increases have been less dramatic although in 1986 Brooke Bond Tanzania produced, on some 2,000 ha, an average yield of 2,412 kg per ha. Contributing to these increased yields have been changes in harvesting policy; for example three leaves and a bud being plucked instead of two leaves and a bud, and the introduction of ‘scheme plucking’ in which individuals are given responsibility for harvesting their own small area of tea (compared with traditional plucking by gangs of labourers). It is fashionable to criticise plantations. They are chastised for occupying land which might otherwise be growing food crops and for using scarce foreign exchange to pay for imports such as fuel and spare parts. Although in some situations there may be some justification for this view, it is one-sided and there are many examples of situations where plantation crops make important contributions to the economy of a country and the welfare of its people. Nevertheless, fluctuations in the world price of commodities can have a big effect; for example, in Tanzania the demise of the sisal industry in the 1960’s and 70’s followed a fall in the world price of sisal. The profitability of the tea industry is similarly sensitive to such price changes. The major factors constraining production of tea, as in other agricultural industries in Tanzania, are foreign exchange restrictions and, until recently, artificially high exchange rates. There are shortages of fuel, equipment, spare parts, fertilisers, and electricity for drying and for irrigation pumps, which cause estates to keep high levels of stock in order to maintain production throughout the year. Shortage of people prepared to pluck tea has been another problem especially when there were no consumer goods to be bought in the shops. Until 1978 research support for the industry was provided by the Tea Research Institute of East Africa with its sub-station in Amani, Tanzania but this was subsequently broken up. Although cultural trials at Amani have been recorded since then little new research has been undertaken. However, in 1986 the Federal Republic of Germany provided money to buy a farm in Mufindi which is to become the headquarters of a new Tanzanian Tea Research Institute which is being funded by the Tanzania Agricultural Research Organisation (TARO) through a cess on all tea sales. A study of the factors which have contributed to the increase in yields of tea in the Mufindi district in the last 15 years is being undertaken by Silsoe College in Britain by the authors of this article. About 70% of tea production is exported in bulk either through the London tea auction (30%) or by direct contract sales (40%). Internal sales represent about 25% of production; the popular varieties being Green Label, Simba Chaia and Siftings. Consumption within Tanzania is increasing slowly and now averages 0.2 kg per head of the population compared with 3.1 kg in Britain. Labelled brands for export are Safari, Kilimanjaro and African Pride sold in attractive 100, 250 or 500 g packs. Tanzania stopped importing tea in 1979. Of the tea exported about 60% goes to the UK. The Sudan comes second and other important markets include Ireland, Canada, Pakistan, the USA, Somalia, W. Germany, the Netherlands and Ethiopia. The tea industry has been going through a difficult period. In the estate sector there are soon going to be problems of continuity with many expatriate senior managers approaching retirement age. Recruiting qualified Tanzanian staff is difficult because the estates cannot reward them adequately for the responsibility they are charged with or for the necessity of living away from the main towns. There is also a lack of adequate training at all levels of the industry and an urgent need to establish a viable and relevant research and extension programme staffed by well qualified people. However, during the last year confidence has increased despite recent reductions in the world price of tea. This is partly due to changes in government economic policies and to devaluation which has led to new investments and expansion plans. Given that this new-found confidence is supported by real improvements in the well-being and living standards of all those associated with the industry, then the tea industry seems set to develop again in a positive way. Dr. M.K.V. CARR is Head of Agricultural Water Management at Silsoe College. He was in charge of the Ngwazi Irrigation Unit of the Mufindi Station of the Tea Research Institute of East Africa from 1966 to 1971. Mr. T.C.E. CONGDON is the Estates Director of Brooke Bond, Tanzania Ltd. and has worked in Mufindi for over 30 years. Mr. WILLIAM STEPHENS is a Tea Research Officer with the joint Tanzania Tea Authority, Brooke Bond, ODA Tea Project. Tensions in Zanzibar have continued despite the recent change in Chief Minister (Bulletin No. 30). They reached crisis point on May 13, 1988 when a large demonstration (mostly of young people) approached State House in Zanzibar and presidential guards opened fire. Two people were killed and several others seriously injured. Damage was done to an office building and Party vehicles. Tanzania’s very open press has covered the story in some detail. The following items are taken from various articles in the Daily and Sunday News. had stated in Pemba that some individuals in the Zanzibar Government were opposing the Party. Some people had even torn up Party flags and were threatening the people. April 11. ENEMIES NOISE WON’T AMEND CONSTITUTION. Mr. Kawawa had been asked in Zanzibar if the Constitution could be amended to allow more Zanzibaris on the National Executive Committee (NEC) of the Party. Yes, he had replied, but only if it was the result of a well discussed and fully considered need. The need could not come from outside the country. Mr Kawawa complained that there had been lots of literature discrediting Tanzania’s top leaders particularly Party Chairman Nyerere. April 15. EXPOSE AGITATORS. Zanzibar Chief Minister Dr. Omar Ali Juma had urged Zanzibaris to expose agitators so that the Government could take action against them. Friday May 13 after prayers. The demonstration. May 15. SEIF HAMAD, SIX OTHERS FIRED. PROBE ON ZANZIBAR STARTS. Former Chief Minister Seif Hamad the Zanzibar Minister for Agriculture and Livestock Development (who was interviewed in Bulletin No. 27), the Zanzibar Deputy Minister for Finance, Planning and Economic Affairs (both of the latter are also members of Tanzania’s NEC), the Deputy Speaker of the Zanzibar House of Representatives, a Union MP and two members of the Zanzibar House had all been sacked. This action had been taken as a result of a report submitted to the NEC by Mr. Kawawa after his April visit to Zanzibar. These people were said to have worked to destabilise the Union and the Party. May 16. ISLES DEMO CULPRITS FACE GOVERNMENT ACTION. President Mwinyi had announced that those who had participated in the demonstration would be punished. Apparently the demonstrators had attacked remarks made by Mrs Sofia Kawawa. Chairman of the UWT (the Tanzanian Women’s organisation) in Dodoma on May 7th to the effect that it was high time Tanzania critically examined customary laws, traditions and Islamic practices which oppressed women. President Mwinyi said that Mrs Kawawa’s views had been personal and in no way reflected the position of the Party and Government. Three Muslim Sheikhs had admitted to devoting the greater pan of their sermons on the day of the demonstration to Mrs Kawawa’ s remarks. May 18. WAKIL BLAMES EXILES FOR ILLEGAL DEMO. Zanzibar President Wakil had said that self-exiled Government critics tried to use religion in their schemes to recolonise the Isles. They had made great inroads in the Civil Service and had polarised it into opposing camps. He had directed the Security Services to crack down on unruly youths. May 19. 29 ISLES ILLEGAL DEMONSTRATORS APPEAR IN COURT. Eight people in Pemba had also been questioned about an attempt to set fire to a Government vehicle. Zanzibaris holding anti-Government video and radio cassettes were threatened by the Government with legal action. May 21. SIEVE CCM MEMBERS. The Zanzibar Chief Minister had called for a mechanism to review regularly CCM member’s records to ensure their loyalty to the Party. May 23. REPS (in the Zanzibar House of Representatives) SALUTE NEC ON EXPULSIONS (from the party). We must stop the habit, one Representative had said, that the Mainland is all out to swallow Zanzibar. May 28. TEAM TO PROBE ISLES DEMO. A seven-member Special Commission had been set up by the Government and would be under the Chairmanship of the former Chief justice of Zanzibar, Mr. Abdulwahib Masoud Borafya. June 4. ISLES CONCERNED OVER PLOT TO BURN CLOVES. June 15. COURT FREES 15 IN ISLES ILLEGAL DEMO. Fifteen of the 43 alleged demonstrators had been set free due to lack of evidence against them. In its 14 page, illustrated main cover story Africa Events (June/July 1988 issue) referred to President Mwinyi’s “cuddly, man-next- door persona, full of caring, tact, humility and, above all, like the merchant of hope, an almost oleaginous knack of making one see only the positive”. In an interview the President was reminded that it was almost three years since he had assumed the presidency. Apart from reviving the economy, what other tasks had been occupying his mind. President Mwinyi replied: “When I was elected President I was handed a peaceful and united country. So, besides making sure that Tanzanians do not go hungry, my other preoccupation is to consolidate our unity. I found the country in a peaceful and secure state and I wish it to continue to be so – if not more – when my term expires”. The next question concerned the grievance of some Zanzibaris that they were not consulted about the Union. It had been arranged between the late President Karume and the erstwhile President Nyerere. President Mwinyi explained the background. “Nyerere had always had this idea of having a federation between Tanganyika, Kenya, Uganda and Zanzibar,… President Nyerere had gone to Nairobi to persuade the then President of Kenya, Jomo Kenyatta, to accept the idea and to be the first head of the Federation. The idea was net dismissed out of hand but the leaders of Tanganyika, Uganda and Kenya did not arrive at any conclusive agreement. So when Nyerere got back to Dar es Salaam, Karume visited him. Nyerere briefed Karume on what had happened at the Nairobi meeting and asked him to feel free, if he wished, to join in when he was ready. Karume jumped at the idea and said that he was ready to join there and then”. it is universally common for such infant ideas to be born by either a single person or a few persons … after the Union, in 1965, there was an election for the President of the Union … the Zanzibaris overwhelmingly voted yes except in one constituency in Pemba (Ziwani) where there were seven hundred no votes. We voted yes once more in 1970… and in 1980”. The President was asked why he had said that those against the Union were following their own selfish interests. The President replied that amongst several underground publications being imported into Zanazibar from overseas at present was a red booklet from Denmark published by Tanzanians resident there. The words in the publications were the same ones being used by those few who are in Zanzibar. Even Their placards contain the same words…those who are against the Union are people like the ones who are in Denmark”. In a strongly worded letter to the Editor of Africa Events (June/July issue) F.E.M.K. 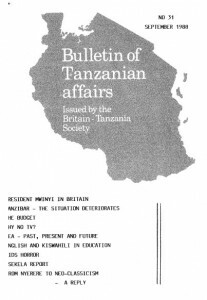 Senkoro referred, under the heading ‘The Last of the Empire’ to what he described as a rather strange belief that the standard of education in Tanzania had fallen due the poor state of the English language in schools and colleges and to former President Nyerere’s reference to the importance of English as ‘the Kiswahili of the world’. “The British Government, through her unofficial representative’, the British Council, was, of course, very excited and overjoyed to see the old glory being rekindled. Since that time no stone has been left unturned. Scholarships have been given to young people in education to go to the former mother country to study further about the teaching of English language. Aid and grants to provide Tanzanian schools with teaching materials are coming forth like they never did before. What ecstasy it will be to see, once again, Alice in Wonderland, Robinson Crusoe, Allan Quartermaine and, of course, Shakespeare, among others, being forced down the throats of the Tanzanian kids in the holy mission of trying to salvage our education from the deep pits it has fallen into …….. the state of Kiswahili vis-a-vis ‘the other ethnolects and foreign languages…do indeed show that among the culprits, English language and its presence as a medium is disruptive and an impediment to the smooth development of education in the country …as the language of colonial heritage, attitudes have turned against English since it is seen as the language of ‘kasumba’ (the brainwashed mind). An inordinate use of it may be taken to identify a person as not having been born again in the spirit of the new man that Tanzania had intended to create with the Arusha Declaration ..
Dr. Senkoro was commenting on an earlier article in Africa Events by Dr. S. Yahya-Othman in which he had stressed that the present system of education in two languages in Tanzanian schools and, in particular, the sudden change from Swahili medium in primary education to English in secondary education was not proving successful. He stated that the performance of students in English had fallen appallingly; he quoted a study which had indicated that in 1986 50% of Form IV leavers had scored F in English. Students in secondary schools were not learning when the language of instruction was English. The continued use of English at the higher levels meant that students did not have the time to devote to the conscious use of new Kiswahili terms. The argument Dr. Yahya-Othman said, was not that it is impossible to modernise with two international languages operating in the school – experience of Canada and Switzerland squash that argument; it is not that it is impossible to modernise using a foreign language as the medium of instruction – all former colonies are doing that; the argument is that it is extremely difficult to modernise with English as medium under the present socio-economic conditions in Tanzania. And the most crucial of these conditions is the continued equivocation relating to a switch in medium from English to Kiswahili. Tanzania is still the best hunting country in the world according to the American publication ‘Hunting Report’. Tanzania still has greater game populations and huge concessions that are the wildest, most satisfying to hunt in all of Africa. Safari companies in Tanzania offer the best run and most luxurious hunting experiences available today according to the magazine. The Presidential Salaries Review Commission (The Nsekela Team) has recommended many changes in government structures in its report recently released. The Government is considering the report – Daily News. In his budget speech on June 16, 1988 the Minister for Finance, Economic Affairs and Planning summarised the situation reached at the end of the second year of the three year Economic Recovery Programme as being ‘generally on track’, though some fundamental economic programmes persisted and would take time and perseverance to overcome. For the second year running the economy as a whole grew faster than an increase in population estimated at 3.3% p.a. Growth at 3.9% indeed fell short of the rate 4.5% envisaged in the Programme, still more of the 5% average rate assumed in the Five Year Development Plan beginning in July 1988. There is, however, a possibility that the official calculation of growth rate (GDP) underestimates the true position owing to the emergence of small scale and informal activities, which are not adequately represented in the published statistics. At this stage certain important gains can be recorded. The production of food crops is substantially greater than in previous years and the prospects for further growth are good if the weather holds. Consumer goods are again widely available. A tentative start has been made with the rehabilitation of industry, with textile production increasing from a very low level by over 20% above the previous year, rubber products by 49% and cement by 15%. Industry’s contribution to export earnings, though still modest, rose by nearly 75% between fiscal 1986-87 and fiscal 1988, partly stimulated by the search for foreign exchange to finance industrial raw materials (the ‘Export to Import’ scheme). A beginning has also been made with the rehabilitation of internal transport by giving priority in the allocation of foreign exchange to the purchase of spare parts for the railways and for road vehicles and the procurement of 1,040 new lorries. In general, expectations appear to remain buoyant. The grave difficulties in the way of closing the gap between imports and exports have been explained in some detail in Bulletin No. 28. The programme envisaged an increase of 11.6% in export earnings in 1987; in fact the foreign exchange income from this source during 1987 remained almost the same as in 1986, though it appears that in the following half year an improvement was recorded, showing a 9.3% increase in fiscal 1987-88 over the previous year. It seems, therefore, that the measures taken to boost export earnings, such as the ‘Export to Import’ scheme and the ‘Own Funds’ scheme may be yielding some results. Nevertheless, the trade deficit of $ 745 million remained at nearly twice the size of export income. These figures probably deserve some correction owing to the unrecorded income believed to have slipped through under the trade liberalisation scheme. Export volumes of all the main items traded except cotton, sisal and tea fell during 1987, due in large measure to the deterioration of roads and vehicles, and a serious reduction in earnings was only averted by a dramatic rise of 37% in the volume of cotton exported, resulting in a 37% increase in dollar earnings from this source. Sisal, on the other hand, despite a 50% increase in the volume exported, suffered an 8% reduction in earnings on account of a 39% fall in world price. In the case of coffee, a 20% fall in the volume exported encountered a 39% drop in world prices, producing a fall in dollar earnings of 51%. This reduction has been attributed to the coffee berry disease, an insufficient supply of fertilisers and a shortage of vehicles. These experiences well illustrate how unsatisfactory it is to rely predominantly on the traditional commodity markets and demonstrates the urgency of export diversification. Cotton provides a typical example of the difficulty. Production in 1987 was unexpectedly high and the prospects for further enhanced production encouraging. But processing was held up by the inability of the ageing ginneries to operate at full capacity and delivery was impeded by tbe shortage of lorries and rail wagons. As a result, raw cotton has cluttered up the warehouses and village stores, getting in the way of the 1988 crop. The UK Government has offered help with the improvement of ginning capacity in the hope of getting the 1987 crop out of the way before the 1988 harvest. The increase in stocks also had its implications for the money supply. Substantial funds at high rates of interest had to be found to finance these stocks, with the result of a large and unwelcome increase in bank credit fuelling inflation. It is indeed a paradox that any increase in export commodities is liable to make fresh demands on the money supply and to counteract the government’s efforts to bring inflation under control. The only solution to this problem lies in increasing dramatically the supply of consumer goods, but the concentration of resources on export industries and the rehabilitation of the infrastructure renders such measures highly unlikely for the time being. As in so many aspects of economic policy, the Government has had to seek a balance between competing objectives. – price controlled items reduced from 22 to 12. The choice for the government is further complicated by the dangers inherent in the continuing 30% annual increase in the cost or living experienced by urban dwellers in mainland Tanzania. With the continuing slow drift downwards in the value of the shilling some inflationary pressures are inevitable, but the level of the index is much more dependent on the price of food and consumption goods, many of which are now outside the scope of controls. The target inflation rate of 25% by June 1988 in the Economic Recovery Programme has not been reached. High inflation increases costs, jeopardises efforts at industrial Rehabilitation, whittles away the incentive advantages of increased Producer prices for agricultural products and, finally, and most seriously, threatens whole populations with destitution unless countervailing measures are taken. The government has taken some steps to mitigate the effects of inflation on urban dwellers. First, on two occasions, reductions in income tax have left all wage earners with more take home pay and further changes in the tax structure will raise the tax threshold to Shs 1,500 per month. Secondly, a 20% increase in the lowest salaries has been announced, with smaller percentage increases in the higher ranges culminating in a 10% rise in salaries above Shs 6,000 a month. Thirdly, following the recommendations of the Nsekela Report, fringe benefits will be paid to government servants consisting of a Rent Assistance for those not in government houses amounting to 10% of salary and a Transport Allowance for government workers in Dar es Salaam of Shs 350 per month. These measures will help significantly to offset the higher cost of living for the time being. However, the most important defence against the effects of inflation has consisted of measures taken by the people themselves by seeking extra opportunities for employment (moonlighting), or by cultivating a patch of ground. It is striking how far such measures are being espoused by middle and upper income employees, who have benefited least from a succession of salary changes. Such activities gain in importance as inflation bites into spending power and even causes troublesome absenteeism during office hours. No government can ignore these effects and the dangers of social unrest that may result from inflation. On the other hand. too generous a compensation for a fall in the standard of living could seriously unbalance the budget and generate new inflationary pressures. Here again, government must seek a middle path. On the whole, in spite of disappointments, the Minister was justified in describing the Economic Recovery Programme as ‘on track’. Where performances fell short involved important aspects of government policy, such as export generation and the control of inflation. But the experience of the programme so far has drawn attention to three aspects that must be kept in mind. First, there is the development of unexpected consequences like the side effects of a healing drug. The log jam in the processing and transport of cotton and its effects on the inflationary trend is a case in point. Secondly, it is always hard to estimate the time scale involved in the implementation of policy decisions. At this two-year juncture in the Programme many developments are in train that have not yet been revealed in the official figures. One example is export promotion, the results of which are only just beginning to show up in the statistics of foreign exchange earnings. Breaking into foreign markets with new products is always a tricky business and in Tanzania the necessary skills are in short supply. Diversification calls for what may a:most be described as a cultural shift and such changes in outlook are not encompassed quickly or easily. Thirdly, no new decisions about exports can be taken in isolation from decisions in other spheres. Money for export may be flowing from the hives but the flow may be wholly dammed up by the absence of special export containers. Cotton may be there in profusion, but the bounties of nature will not reach the ports unless something is done about the ginneries. – Land planning, crop storage, pest control, agricultural research. With all these considerations in mind, the impression remains that the government is managing the Economic Recovery Programme with skill and fortitude in the face of intense difficulties. One essential component is of course the support from outside, which has so far been generous in intention, but in some cases slow and cumbersome in implementation. The reduction of bureaucratic delays and further steps to relieve the debt burden (Bulletin No. 30) will notably assist in securing a successful outcome to the government’s efforts. It is hoped that these improvements in the performance of the international community will be forthcoming. In an emotive article in the Sunday News Sylvester Hanga has reported on a visit to a village 25 kilometres north of Bukoba. “When artillery bombs from Idi Amin’s forces did not inflict heavy casualties in Kanyigo many of its inhabitants ruled out the possibility of another horror in the near future. They were proved wrong seven years later …. some believe that it was at this place that AIDS mushroomed to the rest of the country. Houses have been abandoned and some vandalised by departing suspects. The majority of the 10 cell leaders have been left with less than half the number of households they are expected to head. The reason is simple; some have died of AIDS and the rest have taken refuge in neighbouring villages. Although no survey has been officially carried out to establish the exact number of deaths … a random count of houses with no life inside tells the remaining part of the horror. This is the AIDS era and Kanyigo is witnessing it more than any other part of Kagera region. Meanwhile in Dar es Salaam Second Vice-President Wakil has launched a five year National AIDS Control Programme and the Minister of Health, Dr Aaron Chidua, has been giving AIDS casualty figures from other parts of the country. Singida 18, Musoma 18, Arusha 12 since last year; Kagera region 289 in 1986 alone. The Minister said that he believed that only between 10 and 13% of AIDS patients in Tanzania have reported to hospital. Under large headline ‘Forex (Foreign Exctange) Scandal Unfolds’ the ,Sunday News (July 10, 1988) wrote that ‘With four domestic servants (US$ 40 per month), lunch for four people at US$ 20, a fully furnished four bedroom bungalow at US$500 per month and a combined water and power bill of US$ 10, Tanzania has become a paradise for expatriates and diplomats. The country is also a favourite station for airline crews who act as couriers of smuggled trophies and precious minerals .. , .. at least five embassies also do so as an unofficial, institutionalised practice … these missions also deal in gold, diamonds, rubies, trophies, drugs and hard currency. The diplomats change their currency using street corner, hotel bar hangers-on or even innocent looking cigarette vendors …. An official of the Foreign Branch of the National Bank of Commerce said that withdrawal of money from foreign accounts had dwindled over the past few years and he wondered how foreign clients were meeting their expenses. This is the sad story of all our developing countries and the culprits are from the left and the right, said one African diplomat with the UN Office in Dar ES Salaam’. This question has often been asked about broadcasting in mainland Tanzania. In part, the answer lies in the establishment of radio in the last decade of colonial Tanganyika, and in the sequence of events, pressures, conflicts and personalities in the immediate run-up to independence and very shortly afterwards. Regular broadcasting from Dar es Salaam began in 1951; it had few listeners, temporary equipment and was acutely short of African staff to be trained for operational duties. Help came with money from the Colonial Development and Welfare Fund and with engineering staff seconded from the BBC. By 1955 transmitter coverage was practically nationwide in 1956 legislation was enacted to establish the Tanganyika Broadcasting Corporation – the TBC. The dynamism to build up the new organisation came from Tom Chalmers, also from the BBC, who was experienced in both radio and television. Earlier he had been the first Director of Broadcasting in Nigeria. There he had nurtured national broadcasting from a tiny operation serving the capital, Lagos, into a nationwide service with national and regional programmes. His task in Tanganyika, was perhaps more daunting there was less money available from the colonial coffers and getting that money released from the Treasury was excruciatingly slow; there was a very limited number of Africans with the educational background appropriate for training as producers, engineers and administrators. In February 1961 he could write to former colleagues in the BBC ‘last year there were only 64 African graduates in the whole country – and I have three! Chalmers was in a hurry. He was sensitive to the gathering speed of political change in Africa. He wanted more than one national service to cover the country and to have regional stations outside Dar es Salaam as well as school broadcasting. In Nigeria he had been instrumental in putting political broadcasts on the air; it was not long before Dar es Salaam was broadcasting (in English and Swahili) reports on the day’s business in the Legislative Council. In his annual report for 1959 Chalmers recorded that Julius Nyerere had broadcast on several occasions, especially in December; political leaders had been interviewed and had taken part in discussion programmes, and it was hoped that TBC would be able in 1961 to establish responsible political broadcasting in all its various forms. Throughout the annual reports at the time there is recurrent reference to shortages of money. One of the reports, now in BBC Written Archives, was sent with a note of apology for the format – ‘We are too poor to print it’. The sub-title is ‘How to run a broadcasting service without spending any money’. The speed of final political advancement presented acute problems. Chalmers was anxious that he should hand over to an African with some experience and professional training in broadcasting. Let us turn now to January 1962 – one month after Independence. TBC was under sharp attack in the Swah11i press – not least for the BBC’s influence over it. Clearly Chalmers had to give way to an African. He moved swiftly. He obtained approval for Mr. M Mdoe, the Director of Programmes, to succeed him; Chalmers would stay as Technical Adviser. One of Mdoe’s first acts was to circulate a memorandum to all staff calling for a change in mental attitudes and the Africanisation of all the programme output NOW. That implied much more than dropping the relay of BBC programmes; it meant Africanising the content of programmes. “We are now able to stand on our own feet; let us do so and take some bold steps forward” Mdoe wrote. As Technical Adviser Chalmers could detach himself from day to day operations and think strategically. He had kept in touch with Nigeria. He had first-hand information about the television service – ‘First in Africa’ – that the Action Group Government in the Western Region had rushed through with the help of expatriate contractors as a political ploy in 1959; the transmitter outside Lagos would come on the air in time for the Federal elections. This venture triggered off a chain reaction in Nigeria – the other regional governments were thinking how they could counter this – and in Ghana too. That such a service would be almost entirely dependent on a diet of imported films with many Westerns and ‘cops and robbers’ was entirely alien to the concept of building an African broadcasting service for Africans. Chalmers was also fully aware of the technical problems: the need for a reliable and non-fluctuating electricity supply; the likely restriction of television coverage to Dar es Salaam when radio stations were still required for many provincial centres: the problem of servicing television sets; (it was difficult enough in the early 60’s to get a radio repaired); and, above all, the cost. At that time the newly-independent African countries were being wooed by travelling television salesmen offering package deals to put up a TV station and operate it in its early years. Usually the offer included little local material and much imported film. Just, it was said by facetious critics, two men and a boy with film and lantern slides. The Government in Dar es Salaam was to be no exception. It too came under massive pressure. In May 1962 Chalmers was able to write ‘we have got some at least of the most influential Ministers and Party officials to see reason’. Government rejected all the offers. Broadcasting was to concentrate on radio and that was to be made an effective instrument for Government – and for the people. Mr. CHARLES ARMOUR retired from the BBC in 1981 as Head of School Radio. He was Controller, Western region and Director of Programmes, Nigerian Broadcasting Corporation from 1956 to 1962. He is grateful to the BBC’c Written Archives Centre for documentation he has been able to study.